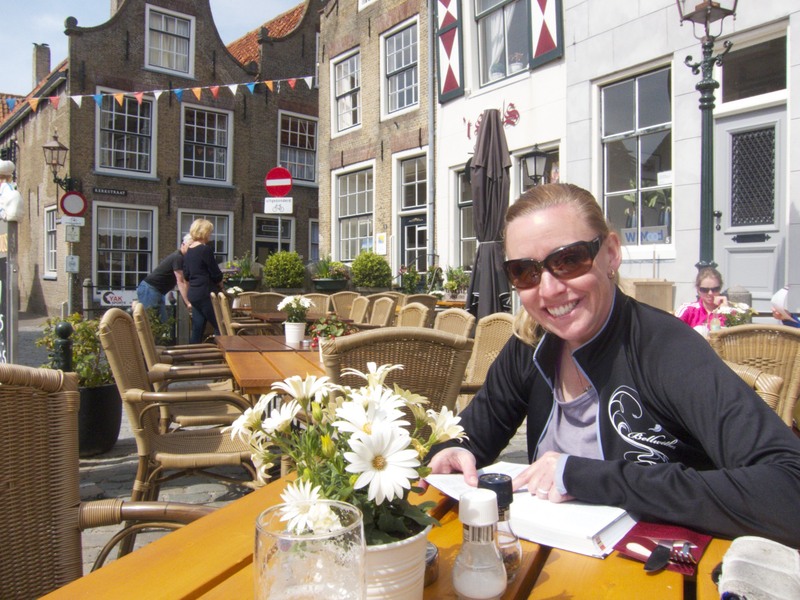 Beth in Goodereede, just before the waitress spilled our beers on her. After 4 days of luxury and copious amounts of food and drink we set off on three straight days of riding about 60-80km each day. Our first destination was a small rural B&B just outside the city of Hellevoetsluis, which was easy to find thanks to the GPS tips I had gotten the day before from one of the experienced cycle tourists we met. Despite the GPS taking us down a road that had been split with a rather large canal we got there in the end. The B&B was nice and our hosts were very gracious. We were too tired to make the 5km trek into town by that point however so we had what was probably our least glamorous meal of the trip and ordered pizza. We slept well, had a fabulous Dutch breakfast and did some work on the bikes before we set off for Middleburg on what turned out to be our longest day of riding. My desire to take the “scenic route” sort of backfired on us today since this particular route was very meandering with some steep hills along the coast. We did however manage to experience a first ever ride right between two wild horses which I happened to capture on video. These scenery was beautiful and although it was slightly overcast most of the day the temp was perfect for riding and we did not get rained on. By the time we finally pulled into Middleburg around 6PM we were very glad to find Simon at the Poorthuys B&B to be such a gracious host.